In conversation with Aranyani Bhargav; Bangalore’s emerging choreographer! 1. A secret Mantra for confidence? 2. Best advice given to you? 3. The day you fell in love with dancing? 4. Favourite place in the entire world? There are too many wonderful places in the world to have one favourite! 6. A movie or book you would recommend? 7.Worst pick up line used on you? 8. Funniest moment while taking class? When one of my students just couldn’t get the left side of her body to obey her and ended up doing something like an egyptian dance instead of a natadavu! We all giggled till we had tears in our eyes. 9. Common phrase that you use in your rehearsals? “Watch your lines”, by which I mean the lines of the body, not a line of people. 10. What is the weirdest compliment you have received? 11. Favourite unhealthy food item? Cheese!!!! I love all sorts of cheese! And can’t get enough it, whether its regular Amul cheese, or fancy Brie! YUM. 12. How do you see dance develop as a career option in India? I think dance has more and more options available today. It’s less difficult today than it was in the previous generation of dancers. Having said that, it is still not sustainable full time for many people. But now dance is not just a solo classical dance career. You could be a contemporary dancer, you could be a member of a dance company, you could be a dance scholar or critic, you can be on reality shows…there are many more options available in a career in dance. 13. As an emerging choreographer, what are your struggles? As a solo dancer and choreographer, thankfully I don’t struggle too much anymore. I’ve been dancing for 25 years and performing in India and abroad for over a decade, so I do get to perform fairly regularly. But as en emerging choreographer, having newly established my dance company ‘Vyuti’ the struggles I face are getting sponsorship and funding for the company. And finding new technically well-trained dancers when older members decide to move on. 14. What is ‘Aranyanis’ bharatanatyam? Aranyani’s Bharatanatyam is basically a facebook page that allows people who like my work to follow it. The reason its titled that is because my approach to dance is recognized by some as distinctive because it looks at Bharatanatyam not as a fossilized classical dance form with a religious narrative, but as simultaneously ancient and modern, religious and secular, human and divine – thereby making it accessible to people who may not be Hindu, Indian, religious or traditional. 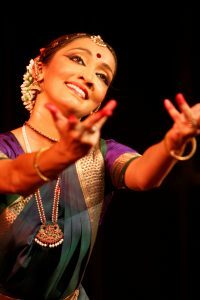 The way I perform and explain my performances allows secular and modern people to also appreciate Bharatanatyam, because the focus is on human emotions – which are universal. 15. What advice would you give to other young performing artists? Don’t turn your back on traditions. Breathe life into them. Keep them alive! And also keep at it! Sometimes it seems like an endless road of struggles and more struggles, but it is a wonderful and fun journey, so keep at it!